Will a new tax be enough to pay for countywide transit? Which tax? Unfortunately, this evokes the old saying, “If wishes were horses, beggars would ride.” The co-chair of the TMP financial task force, Al Berriz, put his finger on the problem when he said, essentially, that many programs in the TMP had plenty of constituents or future customers, but no means of internally generated revenue. This was while he was scrutinizing an enormous spreadsheet showing a 5-year plan for the TMP with a $60.8 million funding gap. As we described in the last post, Governor Snyder’s proposed changes to the way transportation is funded in Michigan, especially because of his proposal for a Detroit Metro Regional Transit Authority, seem to throw askew all the carefully laid plans for the TMP. So here is a question: even if all that comes to pass, why can’t Ann Arbor and even Washtenaw County (assuming that a countywide millage passes) go ahead and have our local transit service as we planned? The answer lies in where the money is. There is surely no more boring word in the English language than “budget”. It is an automatic conversation-killer. But to those of us who care, this is a pulse-racing thing. Those rows and columns determine the fate of, if not empires, at least programs that we really care about. The true role of government at any level is to shift those numbers around to achieve a real result. Of course, proposing programs and outcomes is the first step of leadership. But in the end it is all about the money. Programs don’t run on wishes. Right after “to form a more perfect union” we must ask “who will be taxed?”. So often, in our community discussions about the value of expanded transit options, the question of “how will we pay for it” resolves to “surely someone will take care of it“. 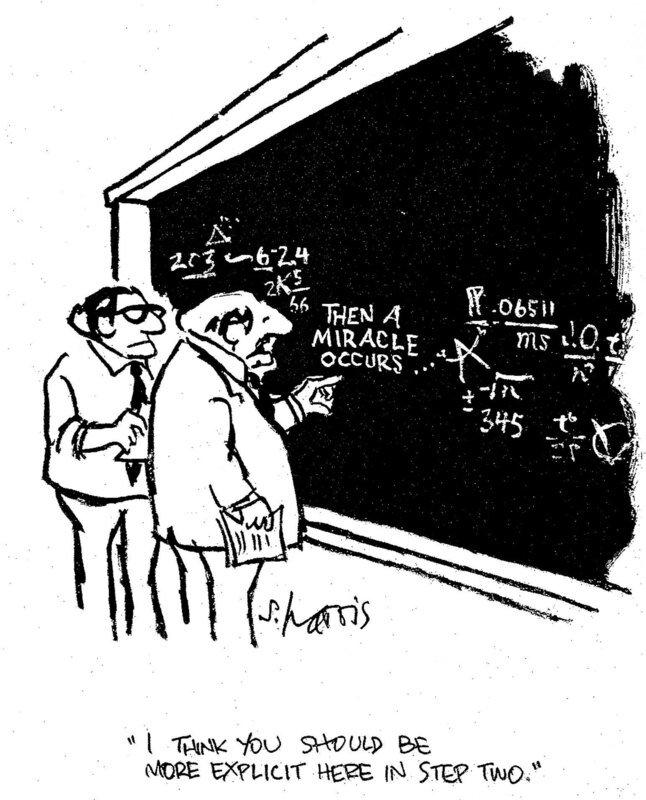 In the memorable S. Harris cartoon, this is expressed as “Then a miracle occurs“. So how are we going to pay for the TMP? Let’s start with the AATA’s current year’s budget. A budget has two essential elements: Revenue and Expenditures. The difference between them is either a surplus or a deficit. (Reserve funds are outside the budget, but a deficit budget generally draws on them to make up the difference.) The AATA’s projected expenditures (expenses) are $30,410,616 for the current fiscal year. But its revenues are projected to be $29,418,996, a deficit of $991,621 (let’s just call it a million dollars). These are from the Ann Arbor perpetual millage. As related in our post AATA Yesterday and Tomorrow, this was originally 2.5 mills, but the rate has been whittled down to about 2.0 mills by the requirements of the Headlee Amendment. In addition, Ann Arbor property values have fallen. But this is the backbone of local support. Lack of elasticity of demand Transportation planners often speak of “choice” passengers, as distinguished from those who must use public transit. If transit becomes too expensive relative to the cost of driving a car, people stop taking the bus. Social constraints Part of the purpose of a mass transit system is to serve the disabled and elderly. The special services for them (referred to as “demand” services, vs. fixed-route services) are simply not going to pay their way. Otherwise, those with special needs could simply take a taxi. Also, since many of those who must take the bus are lower-income, it is not practical or helpful to set their fares too high. At the recent u196 meeting, AATA transportation analyst Chris White stated that there has never been a mass transit system in the US that has made a profit. It seems that even being self-supporting is likewise a stretch. Since AATA is an Act 55 authority, it can in theory extend service to areas within 10 miles of its core area only by a formal contractual agreement in which the participating units of government pay for the service. The POSAs have varied over the years, but the notable ones are Pittsfield Township and the City of Ypsilanti. The Canton Express and Chelsea Express are not currently paid for by POSA income. They are being funded by a combination of state and federal grant funds, and Ann Arbor taxes. It also helps that UM subsidizes its employees’ fares on these routes. Under Section 5307 administered by the Federal Transit Administration, urbanized areas receive assistance from the Mass Transit Account of the Highway Trust Fund. Since Ann Arbor is less than 200,000 in population, AATA is not able to receive direct Federal operating assistance, but it does receive Federal formula funds (FFF) for capital expenses and also for certain types of operating expenses such as maintenance. This program is funded under the Safe, Accountable, Flexible, Efficient Transportation Equity Act: A Legacy for Users (SAFETEA-LU), also called the “transportation bill”. So although AATA is currently funded by a millage from the taxpayers of Ann Arbor, a greater share of their revenues comes from Michigan and Federal operating assistance grants – most from “formula funds”. In fact, more than 42% of the current budget is from those funds. What if the Regional Transit Authority is formed? As pointed out in our previous post, AATA would become a mere contractor, and the TMP would presumably become advisory. At best, this is hard for making plans. Governor Snyder could, as indicated, move both Federal and state operating funds to that new authority. As the FTA website states, “Governors, responsible local officials and publicly owned operators of transit services are to designate a recipient to apply for, receive, and dispense funds for transportation management areas…” So any new Washtenaw County authority would not be able to depend on those funds. Federal Transportation Funding is shaky. Both Federal and state funds depend on the Highway Trust Fund, aka the gas tax. This has been allocated according to SAFETEA-LU, which has not been reauthorized since 2009, but rather has been extended for ever-shorter periods of time. It has been on life support while the Senate and House battle over a new transportation bill, which is currently in conference. The new bill is to be called MAP-21 (Moving Ahead for Progress in the 21st Century). But the two houses are far apart and currently the House is supposed to take up the bill in December. But let’s put all that aside for now, and assume that AATA also succeeds in surmounting the numerous political problems ahead in instituting a new county authority. (Four townships have opted out, a ” 4-party agreement” is currently under negotiation among representatives of AATA, the City of Ann Arbor, the City of Ypsilanti, and Washtenaw County, and there are unknown pitfalls in getting a public vote to support a revenue measure.) How could the funding gap be closed, given all the current assumptions? The assumption has been that a new county-wide millage will be the chief means of bridging the funding gap ($60.8 million for the TMP’s draft 5-year budget). Since the total taxable value in Washtenaw County is a little over $13 billion (see the table of taxable values in Washtenaw County ), a 1-mill tax would yield $13 million a year. However, since four townships (Bridgewater, Lyndon, Salem and Sylvan) have opted out of participation in the TMP, the TV available for a countywide millage to support the TMP would be about $12.6 billion, for a 1-mill yield of $12.6 million. That is a tidy amount that would just about meet the $60.8 million (5-year) deficit. The really big, big question, of course, is whether a public vote for a county-wide millage will succeed. After all, the taxpayers of both Ann Arbor and Ypsilanti will be asked to vote for an additional millage beyond the ones they already pay, without a major escalation in service. Township voters are notoriously tax-resistant and in some townships, a one-mill assessment is as much as they pay for their township services. Perhaps that is why another source of funds is so appealing. We don’t really have much information, but as noted before, Governor Snyder estimated that a new statewide registration fee would yield about $1 billion per year. The maximum amount of that that could be used for transit (10%) would be $100 million a year (for the entire state). Let’s say that Washtenaw County could be awarded 10% of that (which seems unlikely); it would still be short of the $12 million needed. Snyder also estimated that local registration fees could bring in an additional $300 million a year statewide (again, that would only be a maximum of $30 million for transit). But if the RTA goes through, all that income would be awarded to it for reallocation. Conan Smith estimated a yield from the new local tax might be $4-5 million per year (assumptions not clearly stated), not enough to make up the funding gap even if all that came to Washtenaw County. Of course, Snyder’s registration fee concept would first have to pass through both houses of the Michigan Legislature, and any local registration fees would have to be voted on. If for some reason Washtenaw County has a chance to vote on a registration fee for its own use, it would be subject to local tax skeptics just as a millage vote would be. The schedule for the TMP has slipped a bit, but was trending toward coalescence by mid-next year at least. Certainly if a millage is going to go on the ballot in November 2012, everything will have to be in place by early summer. But will all the developments at the state level be finished by then? Snyder is a skillful and strong political leader, but he has quite a selling job ahead, even with a Republican legislature. And how about all those votes and decisions (even locally) about a whole new category of tax (registration fees)? At the u196 meeting on November 14, Ypsilanti Mayor Paul Schreiber asked Bernstein when the countywide authority would begin to function. Bernstein said that Year 1 would start “as soon as it can” and noted that it would be helpful when it is known where the money is coming from. Then he also said that “we” could continue working on it, using reserves. Now that makes me nervous. I hate to see the AATA running on fumes. There is too much uncertainty out there. Note: This post is part of a continuing series on our local transit system. See The Transportation Page for a listing. This entry was posted on November 18, 2011 at 1:45 am and is filed under civic finance, Transportation. You can subscribe via RSS 2.0 feed to this post's comments. You can comment below, or link to this permanent URL from your own site. Vivienne, again a masterful job of pulling together history, facts, figures, and uncertainties. Now, all it needs as a “can-do” approach to solve the problems you’ve identified! Thanks, Larry. You are definitely a glass-half-full guy, a good thing in difficult times.